PROVIDENCE, RI—Shedding new light on the biological underpinnings behind the behavior, scientists at Brown University announced Tuesday that eating appears to serve a number of key functions besides relieving anxiety. 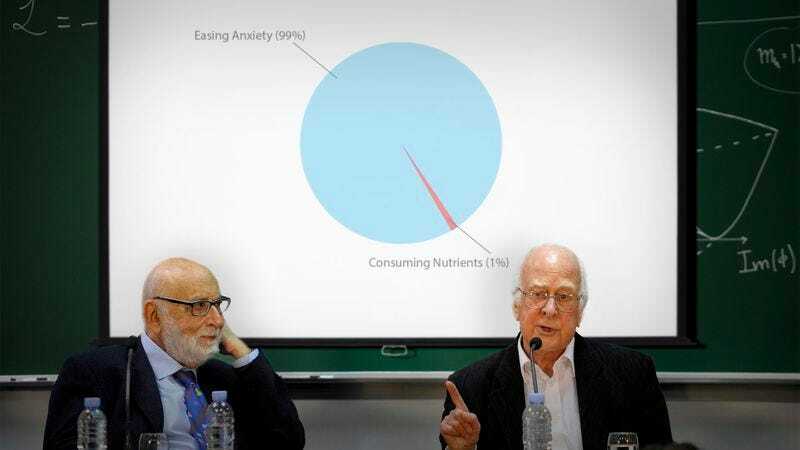 “While a considerable portion of food is indeed ingested in order to distract an individual from feelings of panic and insecurity, our research shows that eating actually confers several benefits beyond temporarily holding despair at bay,” said Dr. Sandra Lutkin, who explained that consuming food has been found to provide vital nutrients to the human body and in many cases replenish it with energy, suggesting that its primary purpose may not be as a coping mechanism at all. “In fact, we observed dozens of subjects and discovered that only a portion of the items they ingested were intended to assuage their apprehension about their job, relationship, or body image. However, much more research must be conducted to learn more about these little-known, non-stress-relieving purposes of eating.” Although she cautioned the findings were tentative, Lutkin posited that there might be additional methods of eating besides frantically devouring a meal directly over a trash can or sink.